Most jeans have topstitching that is almost impossible to duplicate. It is usually best to avoid removing the topstitching. Remove the broken zipper by removing just the stitches that are holding the zipper in place. Cut the tape of the zipper at joining seams. Ready-made clothing zippers can rarely be replaced with a purchased zipper in the exact same length. It is necessary to alter the zipper to make it work. Using the broken zipper, align the tops of the zipper and mark the end of the zipper teeth on the new zipper. Bar tack the new zipper at the mark. A bar tack can be made by using the zig-zag function on your sewing machine. Reduce the stitch length and widen the width of your zig zag to clear the zipper teeth. Stitch repeatedly to create a very strong stopping point for the zipper pull. Cut the zipper just below the bar tack. Fold the top of the zipper tape under the zipper. Insert the zipper tape into the opening between the layers of fabric in the same place you removed the zipper. Baste in place. Use your zipper foot, with the foot set to hold the tape in place, to sew the zipper in place. Stitch as close to the bottom of the zipper as possible. 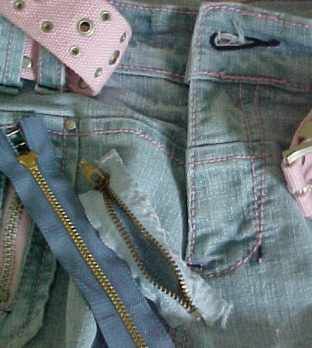 Close the pants and place the unattached zipper tape in position, where you removed the zipper. Fold the top of the zipper tape to the front side of the zipper. Pin and/or baste in place. Using a sharp hand sewing needle, hide the knot under the zipper tape where it is folded under. Bring the needle through the fabric, catching just ONE layer of the fabric, so that your stitches will not be seen on the outside of the garment. Use a back stitch to sew the zipper in place. A back stitch is created by bringing the needle into the fabric behind the previous stitch. Remember to only stitch through one layer of the fabric. Use tight, even, small stitches. Bar tack the end of the zipper to create a very strong hold. This area of the zipper will get pulled on and must be anchored strongly. You've done it, without removing and fighting to duplicate any of the top-stitching!